Today, we’re going to use some of that gel to make this deeply moisturizing face cream, that’s suitable for dry or mature skin. If you don’t have fresh rose petals handy to infuse the aloe, that’s okay – you can just use plain aloe instead. This cream contains jojoba oil (great for moisturizing skin and leaving it soft and supple) and rosehip seed oil (a potent wrinkle fighter used in anti-aging products). Shea butter lends its anti-inflammatory and rejuvenating properties while aloe helps keep your skin smooth and hydrated. Stearic acid is a vegetable derived product I buy HERE from Mountain Rose Herbs. Its purpose in the recipe is to help thicken the cream. I’ve also noticed that creams made with stearic acid stay fresh longer than ones I make without it. If you decide to omit this ingredient, I can’t be sure the recipe will work correctly. 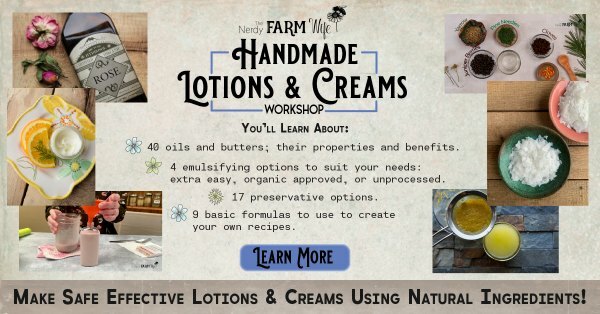 Are you a home hobbyist, looking to learn more about making natural, safe, and effective lotions and creams for your family? If so, I have just the resource for you! 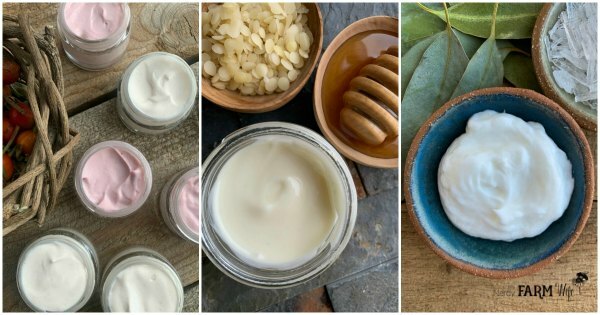 My Handmade Lotions & Creams Course will teach you about natural preservatives and emulsifiers, along with herbs, flowers, and other wholesome additives for your creations. Also included is 30+ recipes and formulas, downloadable charts and printables, plus 10 video demonstrations. Learn more about it by clicking HERE or on the image above! Combine the jojoba oil with shea butter, beeswax pastilles, and stearic acid in a heat proof jar or container. (Rosehip seed oil should be kept unheated, so don’t add that yet.) If you don’t want to use jojoba oil, you can also try: sunflower oil, olive oil, avocado oil, hemp oil, coconut oil, and so forth. Instead of shea butter, you can try mango or cocoa butter. You can buy all of these items from Mountain Rose Herbs, your favorite online supplier, or check your local health store for ingredients. Set the jar containing the oil, butter, beeswax, and stearic acid down into a small saucepan containing just a few inches of water, to form a makeshift double boiler of sorts. Set the pan on a medium-low burner and heat gently until the beeswax is melted. Shea butter can become grainy when overheated, so keep a close eye on progress and remove from heat as soon as melted. Pour the hot mixture into a small mixing bowl, stir in the rosehip seed oil, and then let cool to about room temperature. If using a preservative, add at the recommended temperature. I’m currently a fan of using NataPres at a rate of 2% or Leucidal Liquid SF at 2 to 4% (I prefer to use closer to the full 4% amount, to be sure I have an effective amount). To figure the amount needed, add up the weight of the ingredients – which are 137 grams in this recipe – then multiply by 2% (.02) to get 2.74 grams needed, which I would just round to 3 grams of NataPres for this recipe. For Leucidal Liquid SF, multiply by 4% (.04) to determine that you should add 5.5 g to preserve your lotion. Lotioncrafter has a wide variety of other preservatives to choose from too, along with their usage rates listed on their site HERE. When it’s cool, drizzle the rose infused aloe (or plain aloe) into the thickened oil mixture, add your essential oils, and start stirring. You can whisk thoroughly with a fork until a gel like texture is achieved or use a hand mixer and beat for five to ten minutes until you obtain a thicker cream. Pour into jars. If you don’t want to use a preservative, the shelf life will be pretty short – around 1 week if stored in the refrigerator. Make in small batches and apply generously! 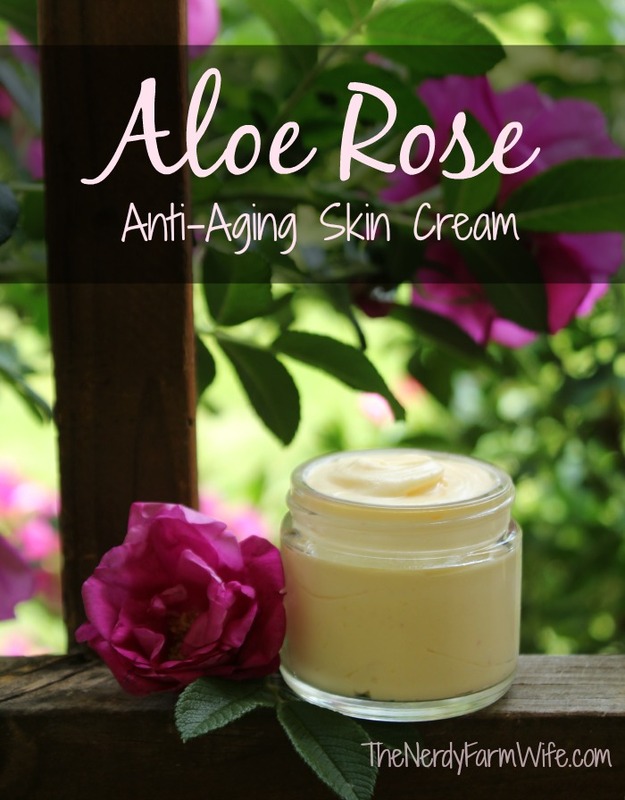 Did you enjoy learning how to make Aloe Rose Anti-Aging Skin Cream? Let’s keep in touch! Subscribe to my newsletter to receive my latest natural soap ideas, herbal projects, and other DIY recipes sent straight to your inbox two to four times per month. Tagged aloe, cream, rose. Bookmark the permalink. I really want to try this. Might need to do some shopping to get the ingredients. Thanks for another great recipe! Thanks again for your fantastic website…what an absolute treasure!! I love the info and your wonderful recipes. Thank you for taking the time to look into things. Hi Rayetta, Thank you for the kind words – I’m so happy that you enjoy the recipes! Recently discovered your gem of a blog and I’m loving it! I’ve been making a facial moisturizer for a little while that’s just the aloe, jojoba oil, rosehip oil, and a few drops of frankincense. I shake vigorously and then re-shake every time I apply it for 3-4 days and magically it combines into a perfect lotion consistency without the emulsifier issue or wax needed. Just a thought :). Looks like a really great recipe and can’t wait to make up a batch! I have a question for you about rose water…I made my own last year and have some left over in the fridge, way back in the back :). Any thoughts if its still good enough to use to infuse the aloe? Hi, I’m new to making this sort of stuff and I haven’t figured out a way to accurately measure out shea butter without having to melt it, I know it’s probably obvious and I am completely blind to it or maybe melting it is the only way? I really have no idea. I love your blog! hi thank you for the recipie. Can’t wait to try it out. Have a quick question though regarding the cocoa butter. Does it not give a tan tint to the body/face? In the south Asian community people like to brighten their skin while keeping the natural tan … However I’m just wondering if instead of Shea butter, cocoa butter is used, is it going to give brownish tint to the skin over a period of time? PS: how many drops of rose and lavender essential oïl (of each) do you add in this recipe? Being very new to this, i’d rather ask! thank you! I was wondering if you could just use the aloe right straight from the plant rather than buying a processed gel? Hi Melanie, You sure can! It will be a lot more perishable though, so definitely store in the refrigerator and keep a close eye out for spoilage. I would like to use raspberry seed oil for its natural UV protection in this recipe, how much do you suggest I add? Hi Gulden! I’m afraid I haven’t used that ingredient before to offer good advice. This search: https://www.google.com/search?q=raspberry+seed+oil+usage+rate might give you some better guidance. This link had some good information too: http://www.lotioncrafter.com/red-raspberry-seed-oil.html Raspberry Seed Oil looks like it would be a wonderful addition though – I’m going to have to order some to try out myself! Being that i live in south Louisiana, its so hot here and i would like to add phenonip to this recipe just to be on the safe side so it won’t go bad. How much of phenonip would i add? Hi Shana, That’s probably a good idea. I need to update all of my lotions and creams posts to reflect some preservative options and amounts. I haven’t used phenonip myself, but Lotion Crafter’s site says to use 0.5% to 1.0%. Ingredient weight is 137 grams total. You could round down to 1 gram of phenonip & that will still be over the 0.5% low range, so I think that should work! Thanks, i am not great with the math involved myself. Lol I usually follow a recipe to the T. I have been searching and searching for just the right lotions, cream and soaps. I love your site. You have so many great things. Keep up the good work. Hi Marina! I agree that creams with beeswax are very rich! They work great for my dry skin, but if you want a lighter lotion that absorbs easier, you might want to try out emulsifying wax instead of beeswax. You can make a lotion that holds a lot more water than beeswax and sinks in more quickly. Here’s an example of one: https://thenerdyfarmwife.com/basil-anti-aging-face-cream/ and I have more in the works! Help! I made a batch of this one month ago and after 2 or 3 weeks there started growing fuzzy mold all over it :( I used the leucidal liquid sf at 4% as directed. Any idea what happened? Yikes! I haven’t had that happen yet with Leucidal Liquid SF – I’m sorry that it happened to you! A few questions to help us brainstorm a bit – what type of aloe did you use? Does it have its own set of preservatives in it? If so, what’s listed on the label? Did you add the Leucidal Liquid SF after the lotion had cooled below 104 degrees F? Where did you store your lotion? Someplace like a bathroom that gets high humidity and fluctuating heat might cause some problems. I’d love to hear more information and maybe we can pinpoint the culprit. You are incredible- thank you so much for your help!! 3) It was stored in the bathroom, on the counter (covered) in a metal tin. Any ideas? If I re-do the recipe, what should I try differently first? Again, thank you!! I so love this cream! Is this the same cream that you made in early September or a new batch? Beeswax based creams can be SO finicky and they can sometimes separate much sooner than those made with emulsifying wax. Once it separates, some people stir it back together before each use. I don’t always have the best of luck with that method, but you could try to drain off the extra water, stir it really well and then use it up fairly quickly. While I do love the richness of these types of beeswax-based creams for my dry skin, you might be a lot happier with ones that use emulsifying wax instead. (Or a blend of beeswax and emulsifying wax.) They are a lot less fussy to make and maintain! If I were to use emulsifying wax instead of the beeswax, how much would you recommend? And how much does this specific recipe yield? I’m looking into containers :) Thanks! Hi Molly! You would have to completely reconfigure the recipe for emulsifying wax. Beeswax-based creams have higher amounts of oils and butters and less liquid. With the emulsifying wax, you use a higher ratio of water and a lot less oil, so they don’t interchange. and just adapt it so part of the water is aloe (or rose-infused aloe) instead, and also swap out some of the oils. You could take that basic basil cream recipe and make it up all sorts of fun ways by tweaking the oil and liquid types. Won’t Vitamin E help preserve naturally? Or Rosemary oil extract? Could I use those? Hi Gina! Vitamin E & Rosemary Extract help keep oils from oxidizing or going rancid as quickly as they would on their own, but they won’t kill bacteria or mold, or prevent it from growing. I am so in love with your website! I have learned so much about preservatives, thanks for that! My question is (and I read through all the comments before commenting…hehe) I have noticed in some lotion recipes you use an emulsifier and/or stearic acid, I am wondering why you have used these things? Also, I have a recipe that doesn’t have either of these in it but it separates when sitting for awhile so how do I know which on of those things to use and how much to use in a particular recipe? I first learned to make lotions and creams using beeswax and borax – which pair together to make an effective emulsifier. 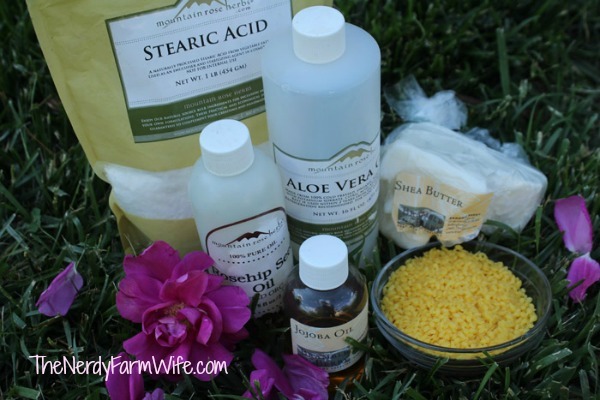 After several readers asked about avoiding borax, I experimented around and found that I liked creams & lotions made with beeswax and stearic acid. (Stearic acid is just a thickener for lotions & creams.) Neither of those is technically a stand-alone emulsifier or combine to make one (on the molecular level anyway), so you’re reliant on getting a good mechanical emulsion by mixing at just the right temperatures and amount – which is easier said than done! And eventually, those bonds are going to break down and separate. So, it’s a little trickier making beeswax-based creams. 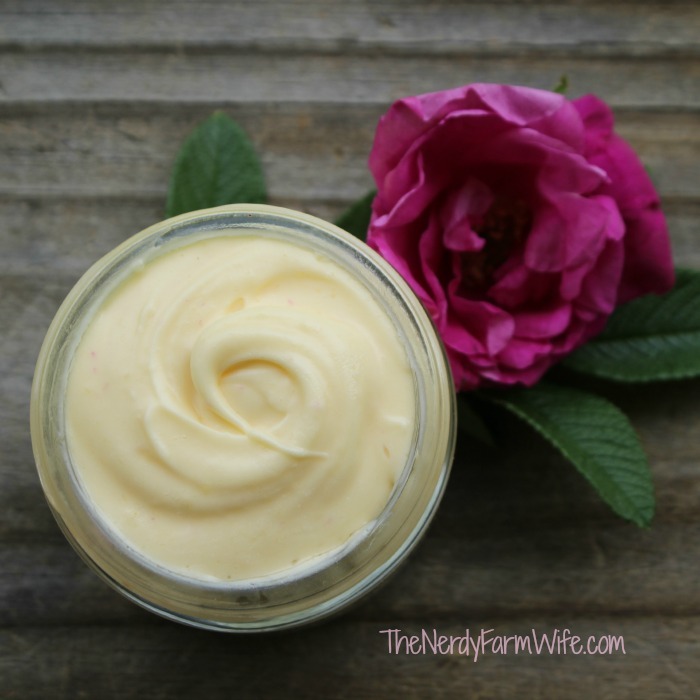 I experimented with vegetable emulsifying wax NF and fell in love with just how much easier it is to make a lotion or cream and have it stay together. You can also incorporate a lot more water to get a lighter, non-greasy product. Vegetable emulsifying wax starts out a vegetable source (usually), but then gets highly processed, so some people don’t like to use it. I only get the kind from Mountain Rose Herbs, because I want to be sure it’s vegetable sourced instead of petroleum sourced. Emulsifying wax is similar, but not quite as processed, as soy wax – so depending on your personal definition of natural, you could use emulsifying wax NF and never worry about separating. If you want to stick with beeswax, you could add borax to it as an emulsifier to help with the separation issue. It’s been a few years since I used it, so I don’t quite recall the amount you’d need for that. under “Face, Body & Hand Creams” and also under “Lotions”, I have some recipes with e-wax NF – you could see the basic structure of them and sub out any oils, liquids at will to create your own recipe.